The plot is located in an unconsolidated urban area in which isolated houses, attached to small agricultural fields, have been built without prior planning. The shape of the plots is determined by the tracts of the fields, while the buildings have a traditional geometry, with a ground floor for the living spaces and an attic under a gabled roof finished in tile. 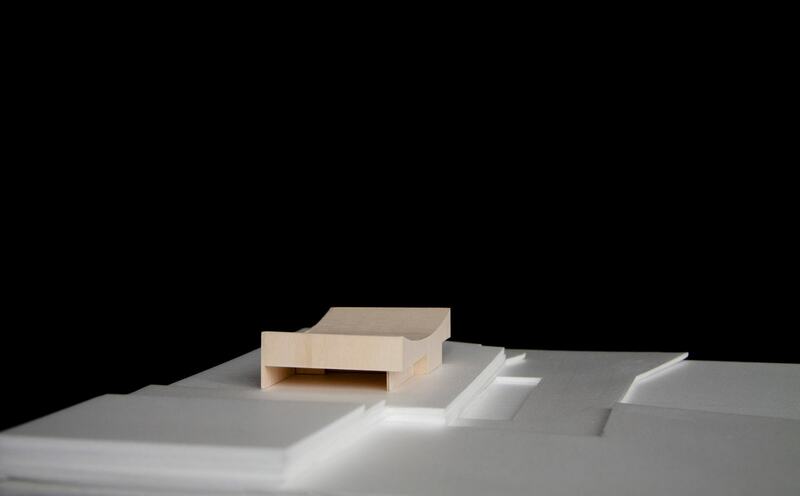 The proposed house is located on a platform in the highest area of the plot, turned with respect to the best views to protect the glass from an unfavorable orientation and to create shade on the exterior porch connecting to the living room. The organization of the space reveals a clear separation of rooms used by day with respect to those used by night. The displacement between both parts of the house creates some covered porches that accompany the entrances to the home and contribute to reducing the scale of the enclosure walls. The roof is the element that gives expression to the exterior. It resolves the intention of the clients to have a sloped roof, and attempts to propose an evolution on the traditional type, which allows the different installations of the home to be integrated under the roof, as well as integrating some solar panels without excessive visual impact. The house is presented as a mono-material monolith of brick, in different formats and arrangements, according to whether it is the roof or a vertical facing. This project presents a turning point for our studio, since during its development, new considerations arose regarding the utilization of materials, trying to explore how a single material may have different forms of expression.